Tristan's resident Administrator is appointed by the UK Foreign and Commonwealth Office, and reports to the Governor in Saint Helena. The current Tristan da Cunha Administrator is Sean Burns who returned to Tristan da Cunha for a second term in November 2016. See below for a full list of Tristan Administrators. Photo showing Administrator and President of the Island Council, Sean Burns, at a meeting of the Tristan Island Council at the start of his second term as Administrrator in the Council Chamber on 14th December 2016. On the right - Conrad Glass, Lorraine Repetto, Iris Green, Terence Green and Sarah Glass-Green. 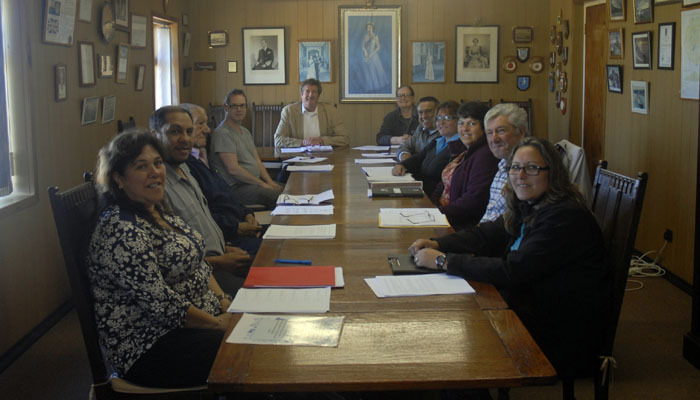 The Administrator of Tristan da Cunha acts as President of the Island Council and Chairs the Heads of Department Meeting. Administrators are employed by the UK Foreign and Commonwealth Office. This photograph shows The Residency - home for the resident Administrator, often used to host Receptions on various special occasions. 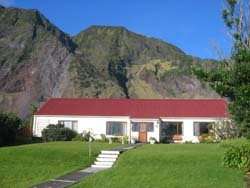 See below for archive photo of the Residency in 2005. Pictured left is the Flag of the Tristan da Cunha Administrator which was assigned in a proclamation made on 20th October 2002 by Governor Hollamby under a Royal Warrant granted by Her Majesty the Queen. It consists of a Union Flag with a white disc edged with a gold ring under a garland of laurel and containing the full Armorial Ensigns of the Territory. The flag is to be used in the presence of the Administrator, or acting Administrator, on land and at sea. Only Acting Administrators sent out by the UK Government to cover for absence are included. The Residency is the Tristan home of the Administrator. This 2005 photograph, taken by Janice Hentley shows the Administrator's flag typically extended by the westerly wind. 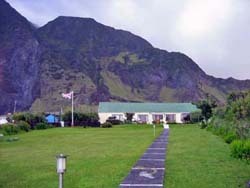 The skyline behind the Residency is dominated by the Goat Ridge.